Reimagined “Miss Saigon” gets standing “O” at the Connor Palace, but . 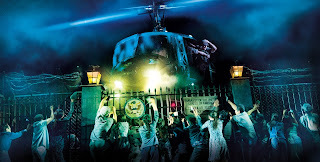 . .
Before you ask, “Yes, a helicopter lands on stage in the touring production of “Miss Saigon,” now on stage at the KeyBank State Theatre, but, as with the production itself there is a “but . . .”. The Vietnamese are the sixth largest immigrant nationality group in the United States. More than one million Vietnamese came to America after the fall of Saigon in 1975. Over 4,000 of those now call Northeast Ohio their home. 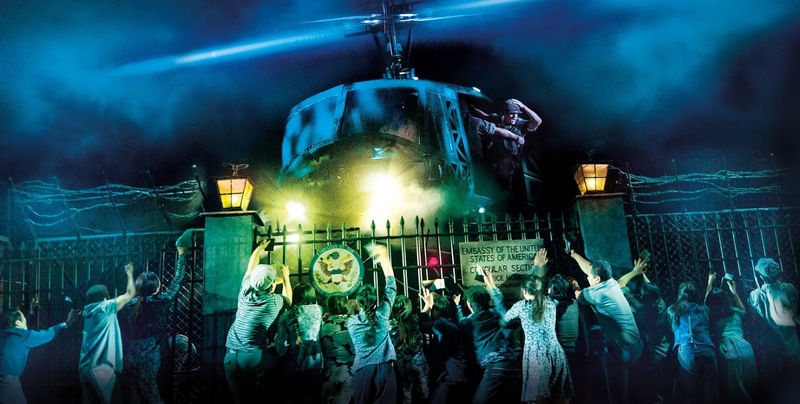 When the show first opened, first in London, and then on Broadway, the big excitement was the “real” helicopter landing on stage. The anticipation over experiencing the technical achievement was so great that the show opened to huge pre-ticket sales, in spite of mediocre reviews of the production in both venues. “Miss Saigon,” in an operetta format with few spoken lines, tells the story of Kim, a young Vietnamese woman who is forced to work in a bar run by a notorious character known as the Engineer. There she meets and falls in love with Chris, an American G.I., but they are torn apart by the fall of Saigon. Unable to get on the last helicopter evacuating troops and civilians from the country, Kim goes on a three-year journey of survival with her son, Tam. Chris is unaware that he fathered the child until, while attending a meeting of Vietnam vets he is told of the boy’s existence. He and his wife, Ellen, must decide what action or lack of action they should take regarding Kim and Tam. This new production, as directed by Laurence Connor, is not a duplicate of the old, but “features new visual images, made possible by the development of new electronic devices and a cast of 42 Asian and Western performers,” thus avoiding the “white-casting” issue of the original. This interpretation also highlights the plight of the Vietnamese women who were bought and sold as prostitutes and the resulting mixed race children, who were/are scorned by locals and uncared for by their absent fathers. Still in place is much of the original choreography by Bob Avian, though it now takes a grittier, more realistic approach that magnifies the power and epic sweep of Boublil and Schönberg’s emotional score. And, yes, the helicopter lands on stage. Well, sort of. The electronically visualized helicopter “flies” over the heads of the audience via lighting effects and appears to land. In contrast to the prolonged visual and emotional effect of the landing in London, Broadway and local stagings I saw, there was nary a gasp or any hand-clapping for this version. Unfortunately, this wasn’t the only problem. The overly loud sound system, had the orchestra drowning out the singers, the voices the singers often sounding “tinny,” as well as the direction which created high-level chaos in almost every scene. Yes, these were times of emotional bedlam, but some texturing of pace was needed to add realism to the goings on and breathing time for the audience. Her duets with Anthony Festa (Chris), which included “The Last Night of the World” and “Sun and Moon” were encompassing. Festa was also cast against type. Usually the role is given to a handsome Broadway leading man-type. Festa seems to have been chosen, instead, because of his beautiful voice and strong acting skills. Though wishing Festa no ill, it would be a treat for CLE audiences to get the chance to see one of their own, Paul Schwensen, who understudies the role of Chris, get to play the role in his home town. Schwensen graduated from Vermillion High School in 2013, where he was mentored by Ted Williams, who was head of the Vermillion theater program and directed Paul and his parents at Lorain Music Theater. Paul played Ren in the 2017 production of “Footloose” at Kent State’s Porthouse theater, where he got his equity card. Red Concepcion, The Engineer, yelled his way through the role failing to texture his performance, thus creating a one-dimensional manipulator. On the positive side, his “The American Dream” received extended applause from the audience. Young Jace Chen was appealing as Kim and Chris’s son. (The part is multi-cast so different audiences will see different Tams. The dancing was powerful, well-executed and spell-binding, the costumes era correct, and the lighting effects helped set the morbid and intense feelings throughout the show. 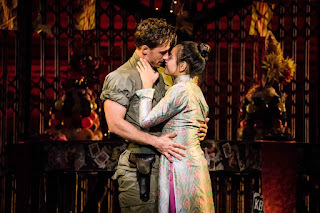 CAPSULE JUDGEMENT: “Miss Saigon” is a powerful piece of musical theater, with a vital story and soaring music. It tells a tale of historical significance, not sugarcoating the conflict, the effect of the presence of American GI’s on the Vietnamese population, and the human chaos that was left behind. The impressive touring production was hampered by an overly loud sound system which had the orchestra drowning out the singers and direction, which resulted in overblown chaos in almost every scene. “Miss Saigon” runs through February 17, 2019 as part of the Key Bank Broadway Series. To purchase tickets, visit playhousesquare.org, call 216-241-6000 or go to www.playhousesquare.org. It is entirely appropriate that the songs of Nina Simone were heard before, during intermissions and following the Ensemble production of Lorraine Hansberry’s “A Raisin in the Sun.” Simone, an activist and singer, was strongly influenced by Hansberry, who was the first female African-American playwright to have a play performed on Broadway. Hansberry, in turn, was influenced by Langston Hughes. Hughes, who spent his formative years living in the Fairfax neighborhood in CLE, was a force in the Harlem Renaissance, which was the African American artistic movement in the 1920s that celebrated black life and culture. “What happens to a dream deferred? Does it dry up like a raisin in the sun?” is a sentiment that has been seminal to the black liberation movement. It is a line from one of Hughes’ poems and inspired not only the title of Hansberry’s award winning play, but is at the center of the script’s message. “Raisin” is, in part. based on Hansberry’s personal experiences of having been brought up in segregated Chicago. Her family challenged a restrictive covenant, similar those imposed upon the Forest Hills area of Cleveland Heights and parts of Shaker Heights, in which minorities were denied the right to buy homes in a specific area. A lawsuit, based on the family’s desire to buy a home in a “restricted” area of Chicago, brought about the Supreme Court case of Hansberry v. Lee in which the Court held that “a restrictive covenant could be contested in court, even though some of the parties involved may have been included in the prior class of neighborhood landowner.” It opened the floodgates to suits that eventually overcame the covenants. 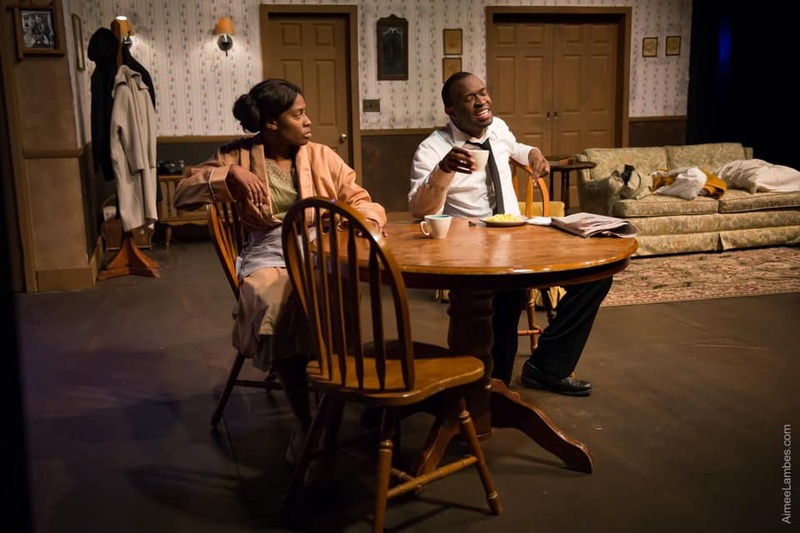 The plot of “A Raisin in the Sun” centers on Walter and Ruth Younger, their son Travis, along with Walter's mother Lena and Walter's sister Beneatha, who live in a dilapidated two-bedroom apartment on Chicago's south side. Walter is barely making a living as a limousine driver and desperately wishes to become wealthy. His plan is to invest in a liquor store in partnership with Willy and Bobo, his street-smart acquaintances. Walter and Beneatha's father has recently died, and Mama is waiting for a life insurance check for $10,000. The question of how the money will be spent becomes the center of the Younger’s existence. Eventually Mama puts some of the money down on a new house, choosing an all-white neighborhood over a black one for the practical reason that it happens to be much cheaper. Mamma gives the rest of the money to Walter to invest with the provision that he reserves $3,000 of it for Beneatha's medical school education. What happens with the money given to Walter, whether the Younger family moves into the “white” area of Chicago, and whether their dreams, like the raisin in the sun, will dry up and die, fills out the remainder of the plot. Ensemble’s production, under the focused direction of Celeste Cosentino, grabs and holds the audience attention. Though, at times, the acting levels dip below what they should, the over-all effect is powerful. Angela Winbourn nicely textures the role of Lena Younger, creating a woman of strong convictions and an abundance of love and loyalty for her family, the kind of female figure who has, from slave times, been the backbone of the African-American family. Zyrece Montgomery nicely develops the image of the “new” black woman who is not willing to follow the patterns of the past and wants to reach for a role as a doctor, not a domestic worker, while still being a dreamer. The rest of the cast, Eugene Sumlin (Walter Lee), Easton Sumlin (Travis), Nnamdi Okpala (George Murchison), Leilani Barrett (Joseph Asagai), Chris Bizub (Karl Linder) and Bobby Williams (Bobo) all develop meaningful characters. Capsule judgment: “A Raisin in the Sun” is a play about the need to keep fighting to make this a more just and free world. This is a play which is meant to counter those who believe that disdain for those who are different is what would “make America great again.” Ensemble does the script proud. It is a production very worth seeing! Ensemble’s next production is A MOON FOR THE MISBEGOTTEN, Eugene O’Neill’s classic script in which Jodie, an amazon-like woman, finds herself drowning in a wave of self-pity and remorse that results in her facing a new challenge to her dauntless spirit from March 8 to 30, 2019. Theater is representative of the era from which it comes. We live in an era of chaos. This is a time of questioning with few answers. It is an era of societal, political, and economic instability. It is an era of news and fake-nears. It is an era of headache-causing conflicts and contradictions. Governments are questioning their philosophical roles. Politicians--their actions, their philosophies, their roles, are up for question. The status of sexual roles--what should be not only the definition of sexual identity, but what role should each of the genders play is up for interpretation. The role of theological and philosophical beliefs is up for grabs. And, the questioning and search for answers goes on and on. Alice Birch’s “Revolt. She Said. Revolt Again,” which is a grouping of vignettes that asks how to revolutionize language, relationships, work, and life, mirrors our society. The script, which is unusual, as it does not identify the names of characters or even what line should be said by which actor, does not follow the usual format of beginning, middle and end. It does start, but the usual structure of the first part being exposition, followed by a conflict or conflicts, followed by a solution to the problem, is not followed. After its beginning, the play, like the society it is commenting upon, falls quickly into chaos. Nathan Motta, Dobama’s Artistic Director, states of the show, “The Royal Shakespeare Company gave a group of select playwrights the opportunity to write a new piece of theatre based on the prompt "Well-behaved women rarely make history." Alice Birch studied various writings by feminists and emerged with “Revolt. She Said. Revolt Again,” a theatrical manifesto for the #MeToo era.” It is that, but, oh, so much more. Also, the play is not for everyone to see and/or appreciate. Yes, that’s the clue to “Revolt. She Said. Revolt Again.” To appreciate what is transpiring on stage, sit and listen. Don't’ try and figure out where the plot is going…there is no plot. Don’t figure out what the speeches mean…the meaning is going to be your emotional, and secondarily, your logical reactions, which may not be readily apparent and may never be clear to you. Be prepared for anything and let that “anything” be what it is. We may be able to trace a line of where gender inequality comes from. How attitudes and prescribed actions of males and females, through the influence of church, state and societal patterns became set. There may be an understanding why the likes of Donald Trump became POTUS and why he acts and reacts as he does. We may be able to grasp some concept of Brexit, the mid-eastern on-going crisis, the basis for Arab-Israeli misunderstandings, where various refugee problems stem from, and the seeming non-ending need for wars. But the answers, or how to confront and deal with the answers, are harder to discover and implement. Dobama’s production, under the creative direction of Sarah Elizabeth Wansley tends to be captivating, if frustrating. The flow, line interpretation, use of music and sound, all help build Birch’s writing. The cast, Lisa Louise Langford, Nina Domingue, Rachel Lee Kolis, Miranda Leeann and Abraham McNeil Adams, each does an excellent job of interpreting their various roles with clarity of purpose. But the ever-evasive answer to “What’s this all about,” remains elusive. Capsule judgement: Maybe the clue to gaining some concept of “Revolt. She Said. Revolt Again,” is to look at the hundreds of shoes that totally surround the three-sided thrust Dobama stage, and realize that they are all different styles, sizes and colors, and accept that they, like the words of the script, are a clue to the chaos of our era, and though some may fit some, they will not fit all, and though some may serve one purpose, they each may fit another. As such, the play, or any one pair of shoes, each is not for everyone! “Revolt. She Said. Revolt Again,” runs through February 17, 2019 at Dobama, 2340 Lee Road, Cleveland Heights. Call 216-932-3396 or http://www.dobama.org for tickets. Next up at Dobama: Jennifer Haley’s THE NETHER from March 8-31, 2019. “Shuffle Along” is one of the most significant musicals of the 20th century, since it was entirely written and performed by African Americans and was the first show that allowed black theatergoers to watch from the orchestra after so many years of segregated seating. It is noted for bringing the Harlem Renaissance to the musical stage. “Shuffle Along” was written by Eubie Blake and Noble Sissler, a Clevelander who graduated from Central High school in 1960. He was one of 6 black students at the school. The program, “The Impact of Shuffle Along,” the first partnership between Karamu House and The Musical Theater Project, will be hosted by Bill Rudman and Tony F. Sias. It features Treva Offutt, Justin Woody, Evelyn Wright, the Joe Hunter Trio and George Foley. Sias, who hails from Jackson, Mississippi, has a graduate degree from Ohio University, and is the President and CEO of Karamu. He was selected by Cleveland Magazine as one of CLE’s “Most Interesting People of 2016. Tony’s interest in “Shuffle Along” comes from the awareness that the show “was a turning point of American theatre, helping Broadway redesign itself.” “It is a seminal piece, has historical relevance and great ragtime and jazz music. Performed in CPH’s Outcalt Theatre, it is yet another reason that local theater-goers should be cheering that the institution moved from its outdated three-proscenium home to the Allen complex in Playhouse Square. This production simply could not have been performed in a proscenium stage. The thrust stage, inserted in the black box space, with the audience closely snuggled around the acting area, makes the entire experience up-front and personal. That’s a necessity for the interactive concept conceived for the “past-to-present” based on Homer’s epic, “The Iliad,” expanded into a tale of societies who still define themselves by their wars. Lisa Peterson and Denis O’Hare have kept the basic form of Homer’s work, added affronts to the audience, where The Poet, performing on a stage area with no set, with a step-ladder as her only prop, relates the tale of the divine-like destructive wrath of Achilles. It is a rage which the authors indicate is within all humans and “gods” alike. It is this rage that makes a person wage war, whether on the battlefield, as a response to road rage, or in personal disagreements. 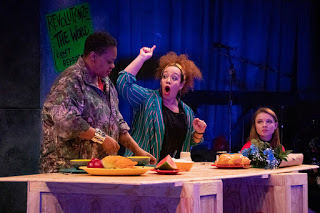 The staging of the tale, wisely directed by Tarah Flanagan and Andrew Carlson, is done in the purest form of theatricality, placing all attention on the spoken word, not on the sets, costumes or special effects which often distract from the message, itself. Flanagan, masterfully performs the ninety-minute, play with no intermission. It is a tour-de-force presentation. Speaking and moving with rapid, sure, powerful physical and vocal control, Flanagan climbs the ladder, moves up and down the theatre aisles, creates and destroys walls, while holding the audience’s attention as her captive. Huzzah!!!! Flanagan is nicely supported by Eva Rose Scholz-Carlson, a 17-year old wunderkind, who plucks and bows her cello with surety, using her self-composed music to highlight the spoken and emotional moods of the script. Flanagan directly confronts the audience, with her fine story-telling skills, speaking of modern day events that parallel the Trojan wars. She asks questions, sits among the audience and interacts with the viewers. She floats, flees, fixates on the events of the war and its modern parallels. At one point, The Poet, in a mind-blowing segment, lists all the major wars that civilizations have been involved in from ancient to modern times. The result is an illuminating awareness of the cruelty and rage of humans. Does it matter if you aren’t aware of “The Iliad” or the history of the Trojan Wars? Actually, no. Flanagan takes us on a journey that has such clarity of idea that literature and history teachers should take into account. Oh, if only our teaching sages could convey the message as well! As the publicity for the play states, “An Iliad weaves humanity's unshakable attraction to warfare with the music of the muses, capturing the contradictory conditions of glory and violence with spellbinding modernity.” Oh, yes it does! CAPSULE JUDGMENT: In a virtuoso performance, Tarah Flanagan, using language that ranges from contemporary realism to epic poetry, and inhabiting over 50 characters, challenges us to realize the role of rage and think, “How do you know you’ve won?” As the modern day conflicts in Vietnam, Syria and Afghanistan illustrate, “How do you know?” This is an absolute “must see” production for anyone who desires to experience a theater production at its finest and is willing to probe what makes us human. 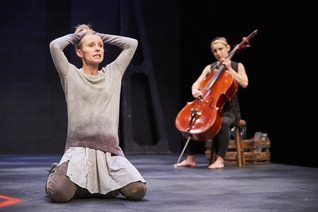 “An Iliad” runs through February 10, 2019 at The Outcalt Theatre in PlayhouseSquare. For tickets call 216-241-6000 or go to http://www.clevelandplayhouse.com. Next up at CPH: Ken Ludwig’s comedy delight, “Sherwood The Adventures Of Robin Hood, from February 2-14, 2019. Richard Rogers and Oscar Hammerstein II, the fathers of the modern American musical, were advocates of social responsibility. In OKLAHOMA, they stressed the building of community. In SOUTH PACIFIC they pegged prejudice. In THE KING AND I, the duo examined intercultural understandings. These were the words I used several years ago to start my glowing Broadway review of RODGERS AND HAMMERSTEIN’S CINDERELLA. 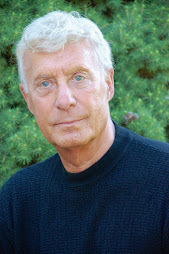 I also stated that the duo would be pleased to know that Douglas Carter Beane, who wrote the new book for the 1957 for-television musical, CINDERELLA, has picked up their social cause theme and added the need for civility, that there can be democracy within a monarchy, and a plea for forgiveness, to the traditional fairy tale story. Beane’s version cuts out the king and queen and adds new characters, such as Jean-Michel, a peasant political do-gooder, who lusts after Cinderella’s nice sister, Gabriella, and Sebastian, the prince’s mean-spirited advisor. He has made the prince, Topher (short for Christopher and about six middle names), into an awkward naïve youth who transforms before our eyes into a benevolent leader and all-around nice guy. These storyline changes work well, adding some mild intrigue to the well-worn tale. The touring production, under the direction of Gina Rattan, based on the original direction of Mark Brokaw, is delightful. It is filled with creative staging, a strong cast (few are seasoned professionals, but it matters little), nicely conceived sets, and well-designed lighting and special effects. “Impossible” and “It’s Possible” are sensory visual explosions, with quick costume changes and puppet mice and woodland creatures transitioning into footman and horses, and a pumpkin becoming a golden carriage. “Ten Minutes Ago” and its reprise were lovely. The cast is strong, with solid voices and high quality dance skills. Kaitlin Mayse creates an Ella (Cinderella) who is strong willed, not the usual meek and mild prince-chaser. She is a modern woman, who can and does speak her mind, when she so desires. Speaking it in “nice” words and convincing manner and singing with a nicely trained voice. 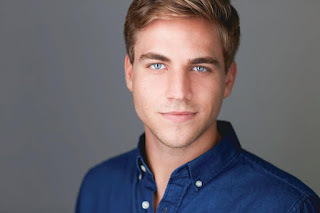 Ella’s prince, Topher, whip-thin Lukas James Miller, is wisely cast. He is not matinee idol handsome, nor full of bluster. Miller is adequately attractive with large eyes that reflect his confused state of his purpose in life. He moves slightly stooped, reflecting the weight of the world he bears on his slight shoulders. Ella and Topher’s duets were all well sung. Zina Ellis was fairy-godmother charming, nicely transitioning from crazed beggar woman to Ella’s guide to a better life. Joanna Johnson was easily the audience favorite as the “zaftig,” overbearing stepsister, Charlotte. Her “Stepsister’s Lament” was a hoot. Natalie Girard was appealing as the “good” step-sister and nicely matched with Nic Casaula as Jean-Michel, the “firebrand” rebel with a cause. The chorus was outstanding, singing and dancing with fresh delight. Capsule judgement: The touring production of ROGERS AND HAMMERSTEIN’S CINDERELLA is well conceived and performed. It is charming and delightful to the eye and ear. It’s the wonderful experience that will leave audiences, young and old, glad they went to the theater and wishing for return trips. 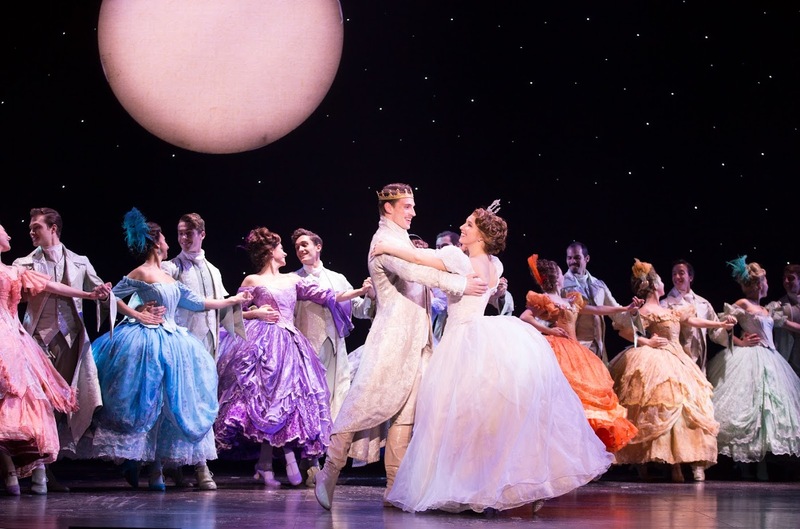 ROGERS AND HAMMERSTEIN’S CINDERELLA is at the Connor Palace for a short run, January 15-20, 2019. For tickets to this must see musical call 216-241-6000 or go to www.playhousesquare.org. Next up at Playhouse Square is the Key Bank series production of “Miss Saigon” from January 29 through February 17, 2019.